Some of the questions I have had regarding mortgages and just loans in general have had to do with whether it is a good idea to make extra payments on the principal. 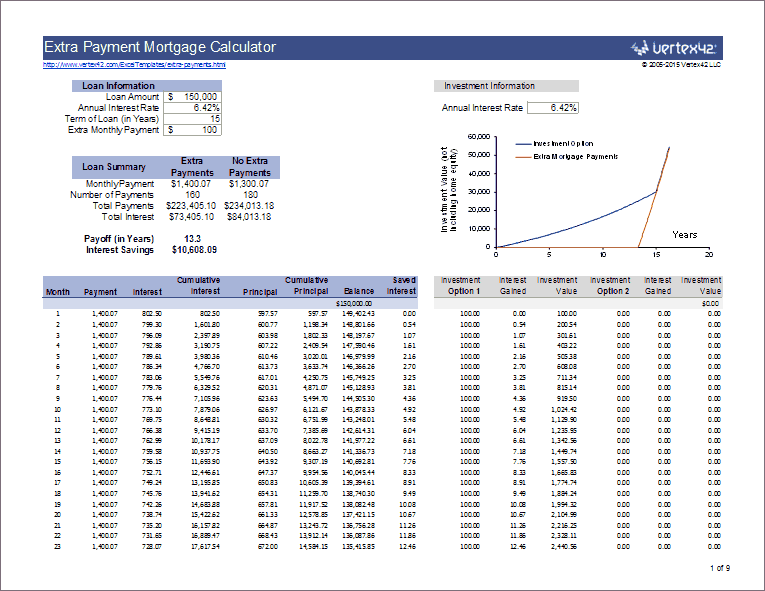 If you have had similar questions, please feel free to download the Extra Mortgage Payments Calculator for Excel and read the rest of this page. Why Make Extra Mortgage Payments? To payoff a home, auto, or consumer loan more quickly. To reduce the amount of total interest paid. To take advantage of high mortgage interest rates when other savings plans have a lower interest rate. All of these may be good reasons to make additional payments, but make sure you understand what you are doing, first. See below for more information about each of these reasons. Calculate the difference in total interest paid on a mortgage loan when making additional monthly payments. Since creating this spreadsheet, I've created many other calculators that let you include extra mortgage payments. The most advanced and flexible one is my Home Mortgage Calculator. * For Excel 2003: The CUMIPMT function requires the Analysis ToolPak, which comes with Excel but is often not installed automatically. To install the add-in, open up Excel and go to the Tools menu > Add-Ins... and check the box next to "Analysis ToolPak". This approach is pretty easy to understand. If you make additional payments, you'd expect the loan to paid sooner. The spreadsheet assumes that the extra mortgage payments are made every month. Each month, your payment consists of both interest and principal. The amount of interest that is paid depends upon the amount of principal still owed (i.e. the current balance). That means that if you pay down the principal, you will end up paying less interest. This is the so-called "interest savings" that is calculated in the worksheet (i.e. the reduction in the interest expense). It may be weird to think of making additional payments as an "investment", but it turns out that making extra payments is nearly identical to placing the money in a savings plan. If the mortgage interest rate is the same as for the savings plan, then the amount of reduced interest expense from making extra payments is identical to the amount of interest "gained" in the savings plan (assuming both rates are fixed and compound monthly). The main difference is that with a savings plan (or other similar investment), the cash is more readily available. What approach provides a better interest rate? What about home appreciation or depreciation? Simply put, this is a completely separate issue. The "interest savings" from extra payments has to do with the mortgage interest rate, not the present value of the home. What about taxes? I'm not going to answer this one because I'm not a professional tax advisor, but remember that the amount of interest paid on a mortgage is usually deductible and the amount of interest gained in a savings/investment account may be taxable. Disclaimer: This spreadsheet and documentation on this page are meant for educational purposes only. We believe the calculations to be correct, but do not guarantee the results. Please consult your financial advisor or lending institution before making any final financial decisions. Some mortgage loans may have a prepayment penalty.